(Virginia, 2010) x + 236 pp. Reviewed by David E. Latane on 2010-05-29. The study of periodicals in the nineteenth-century was first the domain of Victorianists, and one of the reasons was the more diverse nature of both the objects of study and the scholars in pursuit . Subscribers to both the Romanticists' NASSR-L and VICTORIA listservs will know that differences still exist. The latter features a daily stream of queries and replies, broadly cultural; the former stays quiescent but then may erupt in dozens of posts about a single canonical lyric. These differences may explain why, in her Introduction, Karen Fang quotes Keats's disdainful comment on Blackwood's and concludes that her thesis about a "late Romantic investment in periodicals as a vehicle of literary ambition" is "counterintuitive" (1). Perhaps this is true--but only for those of us whose intuitions were honed on the Big 6, Blake to Keats, and who take for granted a conflict between "Romantic idealism" and "the material dynamics of contemporary capitalism" (1). Students familiar with the history of the press or of authorship in the late Romantic era may find this investment unsurprising. In any case, Fang argues that certain writers of this period aimed not just to succeed but to become "Romantic" authors, for whom the tumult of the new periodicals should have been repulsive but was not. It's a very interesting thesis, and one for which Fang marshals significant support. 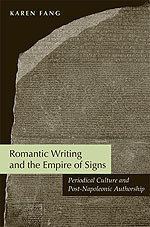 Her larger goal, however, is to "merge the material concerns of imperial history and print cultural studies with the traditionally idealist approaches of Romantic aesthetics, thereby highlighting some key issues in the intersection of empire, periodicals, and late Romantic writing" (4-5). Ultimately, she aims to make a "massive revision," by presenting space rather than time "as one of the form's defining attributes" (179-80). She does this through a sort of keyhole technique, closely reading a small number of texts and peering through their crevices into the wider world beyond. The result is by turns original, inspiring, and maddening. Revealing her interest in Romantic aesthetics and authorship, she chooses one "major" and three "minor" writers: Byron, Lamb, Hogg, and Landon. All of these figures, even Landon, have received a great deal of scholarly attention. But within "periodical culture" they are anomalies. Unlike the authors of all the unsigned, unattached texts lined up along the periodical walls and waiting for a turn on the canonical dance floor, the names of the four writers chosen for this book were inscribed on the dance card while they were alive. While Fang makes a number of notable points about their distinctive steps, the narrowness of her focus somewhat undercuts the generalizations she makes about "late Romantic contributors to the periodicals" (186) in her conclusion. In Chapter one, "China for Sale: Porcelain Economy in Lamb's Essays of Elia," Fang contends that "few studies of Charles Lamb give sufficient attention to the impact of magazines" on his style and reputation (31). Jettisoning the standard critical notion that Lamb simply imitates the prose of Wordsworth and Coleridge (49), Fang seeks first of all to place him firmly within the matrix of the London Magazine--much as Mark Parker does with Hazlitt in his Literary Magazines and British Romanticism (2000). Fang shows how Lamb's collaboration with the London exemplifies his ideology, especially when-- in essays such as "Old China"-- Lamb explicitly identifies "periodical authorship with the contemporary imperial project" (32). Suggestively and illuminatingly, she links the Elia essays (where the signature is like "the chop marks on the bottom of porcelain objects" ), to Lamb's day job in the East India Company, the commodities of empire, and the magazine's claim to a metaphorical empire of print. Lamb, she finds, uses "the same metonymy of global empire within urban topography with which the London debuted" in order to "distill aspects of the massive experience of contemporary empire into the quaint, comfortable, and small-scale world of his familiar' essays" (60). The chapter concludes with a tour-de-force reading of the "Dissertation upon Roast Pig," one of Lamb's most fanciful (and perhaps most racialized) efforts. This essay, Fang argues, "lays the conditions for Elia's guilt-free pleasure in his teacup" (62). By etymologically exploiting "the homophony of porcelain' and porcine,'" she writes, Lamb manages "to speciously dramatize the history of porcelain manufacture" (63). She thus wraps Elia's fancifulness around Lamb's collecting of imperial commodities and his clerk's job within the bowels of the East India Company. In this symbolically suggestive narrative of impersonation and corruption, Gil-Martin's Svengalian influence is a compelling allegory of both the initial appeal that Blackwood's held for Hogg and the detrimental effect the magazine later exerted over him through the "Noctes Ambrosianae," a comic series that appeared in Blackwood's from 1822 to 1835, and which disseminated buffoonish caricatures of Hogg that competed with his hard-won authorial reputation." (66). This allegorical reading of Hogg's Private Memoirs and Confessions of a Justified Sinner, however, rests on a major piece of backdating. Since the Memoirs were published in July 1824, they can be read as referring to the Hogg-roasting numbers of the "Noctes" -and to the whole tortured, on- again, off-again history of Hogg's relation with William Blackwood and his magazine--only if this history is backdated to the period 1817-1824. When Fang argues that the novel allegorically evokes Hogg's persecution within the "Noctes" (88) and specifically its "buffoonish" and "destructive" caricatures of him (66, 97), she fails to note that most of these began only after Hogg's Memoirs appeared. While Hogg and Blackwood had quarreled in late 1821, a few months before the "Noctes" first appeared (the following March), it wasn't until December 1822, after they had patched up their quarrel, that a character named "Hogg" made his appearance, along with the real Hogg's song "The Women Folk" ("Noctes" VI). Furthermore, whether or not the "Noctes" influenced the composition of Hogg's Memoirs, he could not have read when he wrote them more than numbers VI through at the latest XIV (April 1824), which are by and large complimentary. In these early "Noctes," James Hogg, Esq. is not generally a buffoon (although he does speak, mostly, broad Scots) and puts forward some shrewd observations on literature. A better place to look in these years for the source of Hogg's animus would be the very abusive attack in Wilson's "Familiar Epistles to Christopher North. Letter I" (August 1821), and as this letter is connected to Hogg's public acknowledgement of the authorship of the "Chaldee Manuscript" (Blackwood always wanted a mystery about who wrote what), it should be taken into account. In the "Chaldee Manuscript," which was initiated by Hogg but greatly enlarged by Lockhart and Wilson before it appeared in Blackwood's in 1817, Hogg's parodic premise of the rediscovery of an ancient manuscript from the Chaldee (present day Iraq) prompts Fang to argue that Hogg absorbed the contemporary interest in Egypt and in particular the Frenchman Champollion's decipherment of the Rosetta stone. These two things are then found to have a "profoundly significant" (93) though sub rosa presence in the Memoirs. The stone is thus connected as an "imperial icon at the center of [Hogg's] magazine contribution" (79) with Keats's urn and Lamb's teacup; it is the "perfect emblem of Hogg's authorship" (91). While this line of interpretation is poetic and evocative, I think it is finally too subtle to be fully persuasive--especially since the collaborative nature of the "Chaldee" isn't fully explained. If indeed it reflects the influence of the "Higher Criticism" of the Bible, for instance, as Fang suggests (73), that is a movement less likely to be known by Hogg than by the Oxford educated, German reading Lockhart. Nevertheless, placing the Rosetta stone-Egypt-Napoleon-empire axis into a text usually read within the context of Scottish history and Calvinist theology shows Fang's imaginative ability to construct connections, to probe and explore disparate cultural phenomena. Another strong part of the argument concerns the way the "Chaldee" assimilates characteristics of "Maga" (the Blackwood coterie's nickname for their magazine) for its own ends; by using "its heteroglossia to simulate and thus to compete with periodical magazines," it "beats Blackwood's at its own game" (102). Chapter three, "But Another Name for Her Who Wrote': Corinne and the making of Landon's Giftbook Style," pulls off a tricky maneuver: examining Landon's connection to the periodicals through her imitations of De Staël that were published in books, and finding evidence of empire in her writings through its absence from them. "L. E. L." has a tendency to flummox critics. From the first reviews of The Improvisatrice in 1824, Landon was pegged as a poet careless of her gift. Though Fang cites Thackeray's version of this charge, her own examination of the Corinne nexus in Landon's work prompts her to conclude: "It is precisely her strategic use of sentimental conventions associated with her gender as evident in her depoliticizing take upon a prominent Napoleonic novel--that enable her claims for lyric power" (140). Through her periodical and giftbook contributions, Fang argues, Landon develops lyric power via a "second-order style" that becomes "a whole mode of literary production that is based upon the systematic assumption of a more desultory and indifferent mode of reading than that usually assumed in criticism and sought after by the high Romantic writers" (116). Rather than fit audience, though few, then, did she seek a flabby audience, though many? This is essentially Germaine Greer's charge in Slip-Shod Sibyls (1995): Landon is a bad poet because she wrote too much, too fast, and gave the readers too much of what they wanted. But Fang's close readings make a plausible case that "Landon's poetic practice in the literary annuals riffs upon the superficial reading methods" (116); in short, she knows what she's doing, and it's something new. Fang shows how "Corinne at the Cape," a poem first published in the annual Amulet in 1832, makes overt "Staël's role in inspiring Landon's second order techniques" (115). Exploring a number of lyrics, Fang also argues that Landon's appropriation of the Corinne role of improvisatrice for her own sentimental purposes allows her paradoxically to critique empire by not mentioning it. Landon's second-order techniques in giftbook poems written to accompany recycled engravings (e. g., "The Chinese Pagoda") can thus be reappraised as "structural devices that exhibit the author's genius" (140), and as tools through which she expresses her awareness of "the compromises of imperial and periodical collaboration" (139). The final chapter, "Only a little above the Usual Run of Periodical Poesy': Byron's Island and the Liberal," starts with the oddity of a journal conceived and edited abroad but published in London, and argues that this "spatial alterity . . . is particularly apparent in The Island" (143), a narrative poem intended for the magazine. As a bestselling book author, Byron's excursion into the world of periodicals is itself an index to their importance. Though Fang rightly observes that he "was independent of any professional need of periodicals" (145), and though she respects his status as the great exile and the grand Napoleon of the realms of rhyme, Fang aims "to restore both poem and periodical to their rightful place amid the other achievements of Byron's late career" (144), and also to show how both make "geographic space a defining element" (153). Her extended reading of The Island as an artifact of periodical culture, "as a kind of literary Trojan Horse" that would secrete the controversial politics of The Liberal in a sweet, exotic tale, allows us to understand the poem in a new way: as a text with a "revolutionary vision of total and complete nonparticipation in the imperial processes then remaking the world" (174). These four chapters comprise original contributions to our understanding of how the new consumer periodicals after the end of the war relate to authorship and to a generalized notion of "empire." Unfortunately, Fang has a tendency to mar her arguments by going too far, and instances can be found throughout the book. "The very term magazine,' for example, is itself a dead metaphor deriving from the warehouses or storehouses of military munitions." Fair enough. But she then adds that it "no doubt stems from the reports on shipping and naval activity that comprised the contents of the first periodicals" (9)--which is in fact very doubtful. It is interesting that when Keats's sonnets on the Elgin marbles (first published in March 1817) were reprinted in Annals of the Fine Arts (April 1818), they were placed in the poetry section at the back, next to the "Notices of Works in Hand" that listed artworks underway in various artists' studios. But did this position really signify the "unequivocal sponsorship of the individual author," and thus ensure--ironically-- that the Blackwood's-disdaining Keats "should benefit so spectacularly from the magazine format that he disavowed" (15)? Spectacularly? From having his poem printed next to a list of artworks in a magazine? Sometimes a good point is marred by compressed phrasing, or lack of qualification. "In 1819," Fang writes, "the English adventurer Stamford Raffles seized the southeast Asian island of Singa Pura (Singapore) in the name of the East India Company. With this territorial foothold into the once closed Chinese empire, this annexation precipitated rapid increase in British knowledge of China" (60). What would an unwary reader of those sentences conclude? Not, I think, that Singapore was a small village ruled in 1819 by a Dutch puppet, the Sultan of Johor, in a part of the world where the Chinese empire had long been supplanted by Portugal and Holland. And while anyone who wants to understand Hogg's life must weigh the difficulties of making a go on a farm after the end of the Napoleonic wars, one is agog to read that his move to Edinburgh and authorship "had in part been necessitated by the Acts of Enclosure that were then rendering agricultural employment obsolete" (71). Millions of farmworkers over the next 150 years would disagree. More strangely, Fang repeatedly asserts that "Landon was equally well known as the English Corinne'" as she was as "L. E. L." and "to many British readers in 1832, Corinne' referred as much to Landon as it did to Staël" (106, 115). This simply isn't true. If it were, Googlebooks and the newspaper databases would turn up some evidence in the 1824-1840 period. They don't. Landon is now and ever shall be "L. E. L."
In addition, the book has simpler errors of fact. The point about the London Magazine's "Literary Police" column (1820) is based on a misdating of Peel's Metropolitan Police Act to 1819 rather than 1829. While Lamb's teacup may be an example of the "blue and white" china of "Ming Dynasty porcelain," it probably shouldn't then be called "willow ware" (47) because technically that pattern originated in Staffordshire in the late eighteenth century. The "Noctes" in Blackwood's featured Morgan O'Doherty, not "Thomas O'Doherty"--and O'Doherty cannot, in Blackwood's, be simply identified as "William Maginn" (82). While John Wilson was called to the bar in 1815, he was not in 1817 a "recent appointee to [Edinburgh] university's Faculty of Law" (70). Shelley's "Defence of Poetry" was not "originally intended" for The Liberal (149) but for Ollier's Literary Miscellany as an answer to Peacock. The Hunt brothers were not convicted of "treason" (147, 149) but sent to jail for libel. And so on. While the propensity to go too far, and a carelessness in fact checking, do not invalidate Fang's arguments, they are a distracting disservice to them. In her conclusion, "Space, Time, and the Periodical Collaborator," Fang explains how her study extends and alters another recent book, David Higgins's Romantic Genius and the Literary Magazine (2005), particularly in theorizing the importance of space. According to Fang, the actual and metaphorical empires of Britain and the press make space affect our understanding of the time-bound form in which would-be Romantic authors chose to collaborate. Across the spectrum of the industry, Editors, publishers, printers, and writers thematized their activities within the spatial rubric of empire: "By deploying topical geographies that implicitly likened periodical collaboration to imperial enterprise," Fang sums up, "late Romantic collaborators with the post-Napoleonic periodicals aimed to array themselves in the pomp and circumstance of empire itself" (189). Beyond the valuable close readings of texts by the four exemplars, this book lays the groundwork for our understanding of how this happens and why it matters for periodical culture at large. David Latané is Professor of English at Virginia Commonwealth University. David Latané calls my book "original, inspiring, and maddening." To earn the first two adjectives from a scholar whose work has been invaluable to my own is deeply gratifying (his seminal essay, "The Birth of the Author in the Periodical Archive," was a foundational text for my book). But because Latané is piqued by other aspects of the book, I would like to address those objections as well as to reiterate the more important conceptual claim in my book that Professor Latané largely overlooks. First, my overall thesis is that "space affect[s] our understanding of the time-bound form" of periodicals, which Latané mentions but whose implications and critical contexts he never really engages. Building upon seminal studies of periodicals and society by Jürgen Habermas, Benedict Anderson, and especially Jon Klancher, whose analysis of the "empire of signs" provides my title and is discussed extensively in the introduction, I show how the various exotic locales invoked by some late Romantic authors employ those sites of current British imperial interest to figure the authors' relationship to the periodical industry in which they aspired and worked. These authors' representational motifs globalize a literary-professional culture that otherwise had been bounded by civic or national space in Habermas's or Anderson's accounts, and exhibit a commercial and economic sensibility within contemporary literary and print production that has also been explored by Leah Price and William St. Clair. While my study limns the general ethos of individual periodicals (following lines of inquiry pursued by Laurel Brake, David Finkelstein, Catherine Waters, and others), my book remains focused on the territorial and geopolitical motifs deployed and manipulated by specific writers prominent within Romantic and nineteenth-century literary history. To ignore this stated field of inquiry and expect my book to cover the many "authors of all the unsigned, unattached texts lined up along the periodical walls" is to ask that I address an issue I never professed to take up (as well as employ a critical method other than the one I used). Indeed, my book not only demonstrates the centrality of space to the periodical form in a way that to my knowledge has not previously been recognized. Equally important, my book also explains what specific writers gained from their experience with periodicals. By showing how their interactions and occasional clashes with the corporate and capitalist structure of periodicals sharpened their understanding of the contemporary imperial processes by which they figured periodicals, I map their relations to empire itself. This latter argument--which productively merges periodical history with imperial and postcolonial scholarship--Latané ignores altogether. The intersection of geography and literature is a current and exciting trend in critical theory. My book frames its discussion with relation to Pascale Casanova, but its intellectual inspirations begin with Said and include Ian Duncan, Katie Trumpener, and Wai-chee Dimock. I build upon their earlier, largely novel-based analyses by applying their approach to the periodical format, and by doing so I am also revising scholarship on the latter, recasting into a spatial, territorial, and synchronic methodology what has otherwise too long remained a predominantly temporal and diachronic discipline. The five literary case studies I address--Keats's philhellenism, Lamb's treatment of China, Hogg's interest in Napoleonic Egyptology, Landon's depoliticization of Staël's Corinne, or, Italy, and Byron's late poem on Tahiti--therefore encompass a global diversity evident in post-Napoleonic periodicals at a very specific time (the years 1823-24). If Professor Latané feels--as he seems to imply--that my book is too NASSR-like in its "keyhole" focus on single texts and insufficiently VICTORIA-n in its "broadly cultural" representation, I regret that he has retained this sense. After all, as each of my case studies shows (by analyzing an author's topical evocation in both the institutional context of the periodical venue where it was developed and the actualities of the geopolitical processes it portrays), I have employed a broadly cultural approach equally steeped in temporal and territorial contexts in order to demonstrate the sophisticated and self-conscious manner in which contemporary authors likened their periodical collaboration to imperial enterprise. Finally, let me address the "errors of fact" and other alleged moments of "going too far." Shelley's Defence was at one point slated for the Liberal (see William Marshall, Byron, Shelley, Hunt and the Liberal , 140-42). Hogg's relations with Wilson and much of the Blackwood's circle had already soured by 1821, whether or not these relations are portrayed in the early Noctes. Willow ware patterns were derived from the Ming-era blue and white porcelain prized by collectors; Willow ware emulated Ming-era porcelain and made it more affordable, as Lamb's essay explains. The misdating of the Metropolitan Police Act is egregious, and for that I take full responsibility, but it is worth noting that many of the reforms anticipating Peel's legislation were already at work by the early nineteenth century (see Clive Emsley, The English Police , 22-23). Latané himself notes that his observations "do not invalidate" my "original" and "valuable" contribution. I would only add that letting the temporal obscure the spatial risks missing the proverbial forest for the trees--precisely what my book and its focus on imperial pretensions by late Romantic periodical writing aims to redress. Leave a comment on David E. Latane's review.